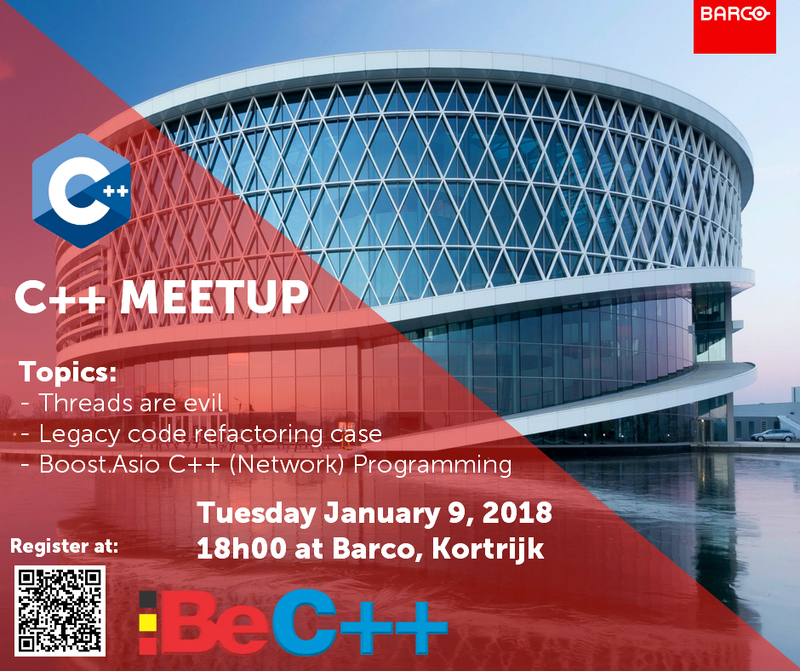 The next meeting of the Belgian C++ Users Group is planned for Wednesday February 28th, 2018 at 18:00 at Nokia. A couple of years ago I wrote a blogpost on how to write a thread-safe singleton using C++11. That implementation used std::call_once(). The most important change is the implementation of GetInstance() which now contains a local static variable (magic static). C++11 guarantees that this will be initialized in a thread-safe way. I have now also marked the class as final, made the destructor non-virtual and private, and deleted the move constructor and move assignment operator. Microsoft has released Visual Studio 2017. More general information about what’s new in VS2017 can be found here. The next meeting of the Belgian C++ Users Group is planned for Tuesday January 24th, 2017 at 18:00 at Nobel Biocare. Nobel Biocare ( https://www.nobelbiocare.com/ ) is sponsoring this event by providing the location, drinks and catering. This talk will continue the talk from November 2016, giving an overview of all the new features scheduled to be included in C++17. This second part will focus more on library changes. Murex is a large financial application – ~15M lines of code of C/C++. Migrating from C to C++ has come with enormous challenges. Essential components had to be upgraded to what a C++ programmer naturally expects today. 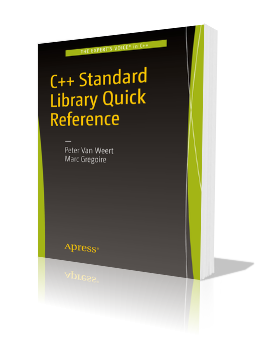 A legacy object framework based on C had to be deprecated in favour of C++, the build system had to be upgraded, proper testing put in place, processes devised to how third-party libraries are introduced in our codebase and used and, finally, a performant serialization system that is in-line with today’s expectations on latency and throughput when communicating between components written in different or same programming language. 20:45: Short presentation/demo by Nobel Biocare followed by a drink. Note: The deadline for registrations is January 20th, 2017! The next meeting of the Belgian C++ Users Group is planned for Thursday November 24th, 2016 at 18:00 at Nikon Metrology HQ. Nikon Metrology ( http://nikonmetrology.com/ ) is sponsoring this event by providing the location, drinks and catering. This talk will give an overview of all the new features scheduled to be included in C++17. Visual C++ supports mobile app development for Windows, Android, and iOS from a single code base, optionally with a thin platform-specific UI layer. The resulting binaries can be deployed to an emulator or to a real device and debugged on both, all from within Visual C++. 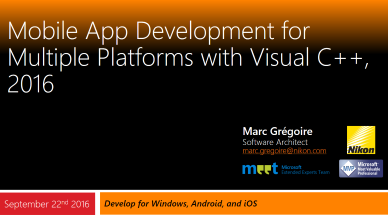 This presentation is a follow up of my previous BeCPP presentation, and as such the session will only briefly cover the basics of cross-platform mobile app development. 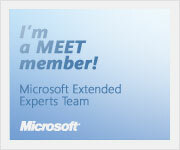 Please view https://www.youtube.com/watch?v=2Y47g8xNE1o or https://channel9.msdn.com/events/CPP/CppCon-2015/CPPConD02V019 for this material in depth. In this follow up, we go over the new features added for cross-platform development since last year. Additionally, we continue where last year’s session ended, and will go deeper on how to write your applications to have a native look-and-feel UI on each of the different platforms. 20:45: Short presentation and guided tour of Nikon Metrology followed by a drink. Note: The deadline for registrations is November 20th, 2016! On September 22th, 2016 I gave a presentation titled “Mobile App Development for Multiple Platforms with Visual C++, 2016” at CppCon 2016. Visual Studio 2015 Update 2, released on March 30 2016, brought a couple of performance improvements. Increased the speed of extracting floating-point numbers with iostreams (in other words, “stream >> dbl”). It’s now up to 19x faster, and all bits of the extracted value are now correct. Increased the speed of std::function’s copy constructor; it is slightly faster with a reduced codegen size. The full official release notes can be found here.